The Duomo is in the form of a “Hallenkirche” (hall church), so-called because the nave and flanking aisles are of equal height. The nave culminates in a polygonal apse while each of the aisles culminates in a small rectangular chapel. Bishop Jacopo Vannucci pierced the side walls of the church in 1481 to build transepts. 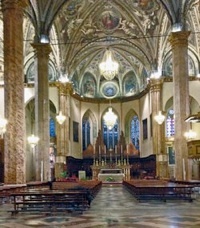 The larger chapel in the right transept (the original Cappella di Sant' Onofrio) served as the bishop's burial chapel and later as the winter choir for the canons. In 1608, a dividing wall was built across it so that the transept chapels achieved their current symmetry. The interior owes its current appearance to Bishop Alessandro Maria Odoardi, who commissioned the stucco decoration in the nave, the false marble painting over the originally brick octagonal columns and the frescoes on the vaults in the late 18th century. Bishop Gioacchino Pecci commissioned the frescoes that cover the walls and the new marble paving of the floor some fifty years later. The Renaissance monument of Bishop Giovanni Andrea Baglioni, which is attributed to the Florentine Urbano da Cortona, is on the left. Bishop Gioacchino Pecci moved it here from the Altare di San Girolamo (which was on the left wall) in the 19th century. In the current arrangement, the effigy lies above a series of reliefs of the four Cardinal Virtues above the sarcophagus. A drawing made just before the monument was moved to its current location shows that, at that point, the effigy lay directly on the sarcophagus, with the reliefs below. The inscription on the sarcophagus records the role of Giovanni Andrea Baglioni in the reconstruction of the Duomo and is dated 1451, two years after his death. The Commune and the confraternities dedicated to SS Dominic, Francis and Augustine commissioned this panel from Giovanni Antonio Scaramuccia in 1610 for the Perugian chapel of the Holy Rosary at Santa Maria degli Angeli, Assisi. He received payments for it in 1610 and again in 1614. However, by the time that the panel was delivered in 1617, the Perugians had exchanged this chapel for the larger Cappella di Sant’ Antonio di Padova, and this was still in construction. The panel was therefore taken to the Chiesa del Gesù in Perugia and then, in 1650, to this site on the counter-facade of the Duomo. The monument of Bishop Marcantonio degli Oddi is on the right. Bishop Gioacchino Pecci moved it here from Sant’ Agostino, Perugia in the 19th century. This stained glass window in the lunette above the portal is by Ludovico Caselli. The Cappella del Santo Anello is the first chapel on the left, in the corner with the counter-facade. This panel on the left wall (above the steps that lead to the entrance to the exterior pulpit) was documented in 1602, when a payment was made to Simeone Ciburri. Perugia is represented by a fine cityscape of the church of Sant’ Ercolano and the adjacent Porta Marzia. This is an allusion to the martyrdom of St Herculanus. This panel on the left wall, which came from Santa Maria Nuova, is by Francesco Appiani. 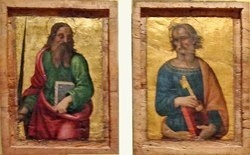 It depicts the Virgin seated on clouds, with SS John the Baptist, Philip Benizi and Philip Neri below. It was restored in 2001. This chapel on the left wall is named for the processional banner that now serves as its altarpiece (see below). This panel by Giannicola di Paolo in the lunette above the altarpiece came from the organ screen, which was demolished in 1784. Three other panels from the screen (a tondo of the martyrdom of St Lawrence and panels of SS Peter and Paul) are now in the Museo Capitolare - see also Art from the Duomo, below. This banner, which now forms the altarpiece on the altar of the Cappella del Gonfalone, is the last recorded work of Berto di Giovanni. It was painted during an outbreak of plague, and was one of the last votive banners of this sort to be painted in Perugia before the Council of Trent. It depicts the Virgin physically staying the hand the vengeful Christ who prepares to unleash punishment to the frenzy of people below. SS Herculanus and Joseph, to the sides of Christ and the Virgin, also plead for Perugia, which is represented by an interesting cityscape. The presbytery took on its present form when the canons’ choir was moved from the nave to its current location in 1524, to comply with the requirements of the Council of Trent. Following the installation of a monumental tabernacle (below), Cardinal Bishop Antonio Maria Gallo reconsecrated the high altar in 1587. Bishop Francesco Riccardo Ferniani consecrated the new high altar (1761-2), which was designed by Carlo Murena and built by Francesco Caselli. He was roundly criticised for destroying the tabernacle so that its gold leaf could be recovered and sold for “a few scudi”. Pope John Paul II visited the Duomo in 1986, and the subsidiary altar that conforms to the recommendations of the Second Vatican Council was erected at the time of this visit. Scholars believe that they were designed by Giuliano da Maiano and completed by Domenico del Tasso after Giuliano’s death in 1490. As noted above, they were moved from the nave to their present location in 1524. The right hand stalls were destroyed in a fire in 1985, and have been replaced by copies. Rocco di Tommaso da Vicenza designed these pulpits on the pillars framing the tribune as part of the redesign of the apse mentioned above. They incorporated statues of SS Lawrence (on the left) and Herculanus [that possibly came from the monument (13th century) to Pope Martin IV that was originally in the old Duomo, in which case they could be by Giovanni Pisano]. Ciancio di Pierfrancesco da Perugia built this throne to Rocco di Tommaso’s design. This tabernacle, which was some 5 meters high and stood on the earlier high altar, was recorded in the 18th century as a “marvellous” work by Bino Sozi. It was gilded by Fiorenzo di Giuliano, to a design provided by Bino Sozi and under his supervision, in 1587. The tabernacle was largely destroyed in 1762, as mentioned above: only the upper part survives, on the altar of the Cappella di San Francesco, to the left of the presbytery - see below. [It was not there at the time of my visit of 2013] A drawing (18th century) by Baldassarre Orsini of the complete tabernacle survives in the Accademia di Belle Arti. •the martyrdom of St Laurence. This chapel to the left of the presbytery was founded by the jurist Pierantonio Ghiberti, whose tomb is on the right wall. The upper part of the tabernacle from the high altar (see above) is preserved on the altar here. [It was not there during my visit in 2013]. Pierantonio Ghiberti commissioned the altarpiece (1620) of the Assumption of the Virgin from Ippolito Borghesi. Bishop Alessandro Maria Odoardi established this chapel to the right of the presbytery in honour of St Emidius, the patron saint of his home town, Ascoli Piceno. The altarpiece by Francesco Appiani shows St Emidius baptising Polisia, the daughter of the Roman prefect. The portal (15th century) on the right wall of the Cappella di Sant’ Emidio leads to the sacristy, which Bishop Giovanni Andrea Baglioni commissioned in 1438. Cardinal Fulvio della Corgna, Bishop of Perugia commissioned its vaulting (1572). He also commissioned the Sacrestia dell’ Arciprete behind the back wall of the sacristy as his burial chapel. The furniture on the right wall was commissioned from Mariotto di Paolo Sensi, il Terzuolo in 1494 and he was paid for the work in 1497. The cartoons for the carvings of SS Herculanus, Peter, Paul and Constantius are attributed to Giannicola di Paolo. Cardinal della Corgna commissioned these frescoes from Giovanni Antonio Pandolfi of Pesaro. They include large figures of SS Herculanus, Constantius, Gregory, Ambrose, Augustine and Jerome (the last four being the Doctors of the Church) and scenes from the life of St Lawrence. The altarpiece of the the Sacrestia dell’ Arciprete is by Ferraù Fenzoni da Faenza (il Faenzone). Bishop Jacopo Vannucci established the Cappella di Sant' Onofrio in the right transept in 1481. The chapel subsequently passed into disrepair, and its altar was demolished in ca. 1608. The inscription on the cornice of the present marble altar in the back wall of the transept records its construction in 1608 for the protonotary Stefano Salvucci. Its design is attributed to Valentino Martelli. The supposed relics of St Bevignate, which had received papal recognition in 1605, were transferred from the crypt of the church of San Bevignate to the new altar here in 1609. The doors to the sides of the altar lead to the Oratorio di Sant' Onofrio (17th century), which the canons used as a winter choir. It is usually closed. The present altarpiece on the altar here is attributed to Giovanni Baglione. This statue by Giuseppe Lucchetti of the former Bishop Gioacchino Pecci (who became Pope Leo XIII in 1878) is on the left wall of the transept. ✴Pope Martin IV (in 1285). Their original monuments in the old Duomo had probably been destroyed in 1373, during the depredations of the papal legate Gérard du Puy, Abbot of Marmoutier, (known to the Italians as “Monmaggiore”). Thereafter, the papal remains had been placed in an iron casket in the sacristy until Bishop Comitoli re-interred them. ✴Leo XIII moved the remains of Innocent III to a new mausoleum that he erected in the right transept of San Giovanni Laterano, Rome in 1891. ✴The remains of Urban IV were transferred to the cathedral of Troyes (the city of his birth) in 1901. The Cappella di San Bernardino is in the corner, near the counter-facade. The Cantagallina family commissioned this altarpiece from Orazio Alfani for their Altare di San Sebastiano, on the counter façade. It was moved its current location, on the wall near the right transept, in 1651, when its original altar was dismantled. Fragments of the original altar (see Art from the Duomo below) survive in the Museo Capitolare. This panel on the right wall (after the baptistery) is attributed to Vincenzo Pellegrini. It was brought here in 1855 from the church of Santa Maria Assunta, Villa Pitignano (outside Perugia). The donor, Annibale Floramonti is depicted at the lower left. This highly venerated image is now in a gilded neo-Gothic tabernacle (1855) on the pillar just beyond the entrance to the Cappella dello Spirito Santo. The inscription records the fact that Cardinal Fulvio della Corgna, Bishop of Perugia ordered its restoration in 1564 after it had been damaged by rising damp. This panel has traditionally been attributed to Giannicola di Paolo, [but it has been more recently attributed to Perugino??]. The inscription on this panel records that Pietro di Giovanni and his parishioners commissioned it in 1432 in honour of God and the Virgin. Two coats of arms flank the inscription: one is the griffin of Perugia and the other probably belonged to the commissioner. 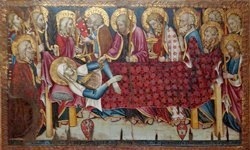 The altarpiece, which is in an anachronistic style, depicts the Virgin on her death bed, surrounded by the Apostles. It is now in the Museo Capitolare. This wooden double-sided icon by Battista di Baldassare Mattioli was commissioned to replace an earlier one that was used in the annual procession from the Duomo to Santa Maria di Monteluce on the Feast of the Assumption of the Virgin. The procession was revived in 1999, using a reproduction of this original, which is now in the Museo Capitolare. ✴the Coronation of the Virgin on the other. Much of the original decoration of the Duomo was done under Bishop Jacopo Vannucci, and since he had previously been Bishop of Rimini, he drew on the example of the Malatesta Temple, which explains the stress on sculpted rather than painted altarpieces at this time. It was probably Bishop Vannucci who invited Agostino di Duccio to Perugia from Rimini. This altar is described in the page on the Chapels of the Duomo. This altar, which was on the left wall (between the entrance to the external pulpit and the side door), was built according to the provisions of the will of Nicolò Ranieri. He named the Ospedale di Santa Maria della Misercordia as his heir on the condition that they would erect a chapel in the Duomo. The Cathedral Chapter conceded the necessary space and the Prior of the hospice duly commissioned the work from Agostino di Duccio in 1473. The documentation specified reliefs of Christ “in pietà”, between the Virgin and St John the Baptist, with God the Father above. The altar was complete by 1474, when two local sculptors pronounced it to be well-executed and worthy of its cost. In 1625, by which time the funds to maintain the use of the altar had been exhausted, Bishop Cosimo de Torres ordered its demolition. Some fragments were recorded at the time of the apostolic visit of 1660: they were still embedded in the wall, although the surrounding structure had been demolished. Costantino Ranieri undertook their restoration in 1703, so that the altar could once more be used for services. However, it had fallen into disuse again by 1792, when it was definitively demolished. A number of surviving fragments (including those illustrated above) were returned to the left wall of the Duomo in 1832. They were removed for restoration i [the 1990s?] 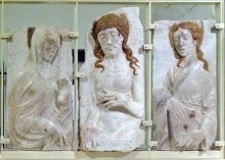 The surviving fragments, which include some that were discovered only recently, were restored and placed on display in the Museo Capitolare in 2013. •panels of SS Peter and Paul. Braccino di Pietro commissioned this altarpiece from Pompeo Cocchi for the Cappella di San Nicolò in 1519. It was attributed to Pinturicchio until a restoration carried out in the 19th century revealed the name of the artist and the date of its execution (some 10 years after the date of the commission). It is now in the Museo Capitolare. ✴St Laurence, who holds the grill on which he was martyred. (The original altarpiece (1576) of the Martyrdom of St Sebastian by Orazio Alfani is now on the right wall - see above). This painting on leather, which depicts the standing saint holding the grill on which he was martyred, was previously attributed to Bernardino di Mariotto. However, a recently discovered document reveals that it was one of a number of such works commissioned in 1562 from his associate, Marino di Antonio Samminucci for the choir of the Duomo. 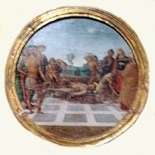 It is now in the Museo Capitolare. This altarpiece in the Museo Capitolare, which presumably came from the Duomo, is signed by Giacinto Boccanera and dated by inscription. ✴the martyrdom of St Laurence. See also the section “Art from the Chapels” in the page on the chapels of the Duomo, using the link below. Duomo: Main page Earlier Church Exterior Interior Chapels.